As a critical friend of the NIOSH Firefighter Fatality Investigation and Prevention Program, I have provided testimony at public hearings and engaged in discussions with NIOSH staff regarding improvement of the quality of information provided in Death in the Line of Duty Reports, particularly in incidents involving extreme fire behavior. In addition, I have provided expert review on a number of Death in the Line of Duty Reports (including F2009-11). The discussion of fire dynamics, fire behavior indicators, and influence of ventilation and wind effects in Report F2009-11 is evidence that this feedback has been heard! I would like to thank Tim Merinar and the other NIOSH staff for their efforts in this area. However, more work is needed. Just over a year ago, I read a news report about the deaths of Captain James Harlow and Firefighter Damion Hobbs of the Houston Fire Department during operations at a residential fire. I recalled Houston had seen a number of fatalities during structural firefighting over a reasonably short period of time. Curious, I reviewed reports on these incidents developed by NIOSH and the Texas State Fire Marshal�s Office. Seeing some commonality in the circumstances surrounding these incidents, I called a colleague at NIOSH and recommended that the investigation of the incident in which Captain Harlow and Firefighter Hobbs lost their lives, include review of prior incidents (and near miss data if available) to identify underlying causal or contributing factors that may not be evident from examination of a single incident. While we often want to know the cause of a tragic event, the reality is that it is often much more complicated that we would like. Investigative reports such as those prepared by NIOSH focus a bright light on the what and how, but often leave the question of why hidden in the shadows. Observations and questions in this post are not presented as an indictment of the Houston Fire Department, or to question the commitment and bravery of Captain Harlow and Firefighter Hobbs, but simply to encourage each and every one of us to look more deeply; more deeply at our profession, at our own organizations, and at ourselves. Epidemiology is the study of factors affecting the health and illness of populations. Epidemiological research is the foundation of public health intervention and preventative medicine. This research is focused at identifying relationships between exposures and disease or death. Identification of causal relationships between exposures and outcomes is critical. However, correlation does not determine cause, and identification of causality is often complex and tentative. For the fire service, epidemiological study has and continues to focus on heart disease, stress, and cancer (see USFA, NIOSH Launch Cancer Study). However, these same concepts can be applied to traumatic fatalities as well. On April 12, 2009 Captain James Harlow and Firefighter Damion Hobbs lost their lives in a residential fire at 7811 Oak Vista in Houston, Texas. On April 9, 2010, the National Institute for Occupational Safety and Health released Death in the Line of Duty Report F2009-11 summarizing their investigation of this incident. Overall, this report is well written and provides an excellent examination of the events involved in this incident. The Texas State Fire Marshal�s Office also conducted an investigation of this incident and released a report a short time prior to release of NIOSH Report F2009-11. Failure to react appropriately to deteriorating conditions. What is missing from this list? Six of the seven items on this list relate to human action or inaction. The report points out the need for policy, procedures, and additional training to address the contributing factors. While this is undoubtedly necessary, does this provide the entire answer? As with all NIOSH firefighter fatality investigations, the focus of this report is on the circumstances and events surrounding a single incident. In this report, there is a brief mention of investigation of the deaths of other firefighters from this department, but no analysis of commonality or underlying contributing factors is provided. This leaves the question, to what extent did organizational culture impact on the circumstances and events involved in this tragic incident? In his keynote presentation at the 2010 Fire Department Instructor�s Conference, Lieutenant Frank Ricci of the New Haven (CT) Fire Department indicated that the culture of the fire service is wrongly blamed for many of it�s problems. Lieutenant Ricci indicated that a large percentage of firefighter injuries and deaths are not due to inherent risks, but to an �unwillingness to take personal responsibility for safety� (Thompson, 2010). I would ask, why are firefighters unwilling to take personal responsibility? What factors influence this pattern of behavior? I suspect that it is our unquestioned assumptions about the way that things are (part of our culture). In this sense, culture is not to blame, but is simply one of a number of contributing and causal factors in many firefighter fatalities. A cursory examination of the facts presented in the reports of NIOSH investigation of traumatic fatalities in the Houston Fire Department since 2000 shows a distinct pattern. Each of the fatalities involved members of the first arriving company where a fast attack was initiated without adequate size up and in most (and likely all) cases failure to assess risk versus gain. A more detailed examination of these events would likely provide a more finely grained picture of organizational expectations that make extremely aggressive fire attack without adequate size-up and risk assessment the norm, rather than the exception. On September 11, 1991, Continental Express Flight 2574 crashed in Eagle Lake Texas killing all 14 people aboard. As with all commercial aircraft accidents, this incident was investigated by the National Transportation Safety Board.� The board identified the cause as failure of maintenance and inspection personnel to adhere to proper maintenance and quality assurance procedures. However, the board also identified failure of management to ensure compliance with approved procedures and failure of Federal Aviation Administration to detect and correct this problem as contributing factors. Board member John K. Lauber, filed a dissenting statement. �It is clear based on this record alone, that the series of failures which led directly to the accident were not the result of an aberration, but rather resulted from the normal accepted way of doing business at Continental Express� (NTSB, 1992, p. 53). Lauber advocated restating the probable cause of this accident as �the failure of Continental Express management to establish a corporate culture which encouraged and enforced adherence to approved maintenance and quality assurance procedures� (NTSB, 1992, p. 54). It is essential to look at the five events identified in reports F2000-13, F2001-33, F2004-14, F2005-09, and F2009-11 (NIOSH, 2001, 2002, 2005a, 2005b, 2010) from a longitudinal perspective to identify in greater detail and understand the common elements and potential systemic cultural issues that influenced the actions of those involved. While the influence of organizational culture is more difficult to identify than failure to comply with good practice, failure to recognize a hazardous condition, or an error in decision-making, it has a far more pervasive influence on fire fighter safety than these specific, individual acts. Based on limited research, it is apparent that the Houston Fire Department (like many others) places an extremely high value on rapid and aggressive offensive firefighting operations. While the outcome of this incident resulted from a wide range of interrelated contributing factors, organizational culture and lack of knowledge regarding fire behavior and the influence of tactical operations were likely the most significant. Identification of organizational culture as a contributing factor in this incident is based on data included in the DRAFT report as well as review of NIOSH Reports F2000-13, F2001-33, F-2004-14, F2005-09, and F2009-11 (NIOSH, 2001, 2002, 2005a, 2005b, 2010) as well as review of the Houston Fire Department Strategic Plan FY2008-2012 (n.d., HFD) and Philosophy of Firefighting (2003, HFD). A memorandum from the Office of the Fire Chief defining the Houston Fire Department�s philosophy of firefighting (HFD, 2003) after the McDonald�s (NIOSH, 2001) and Four Leaf Tower (NIOSH, 2002) fires reinforced the importance of risk assessment in selecting strategies and tactics. In this memo, the chief identified the importance of organizational culture, stating �we pride ourselves in being very aggressive interior fire fighters and look down on those that fight fire from the street� (p. 1). 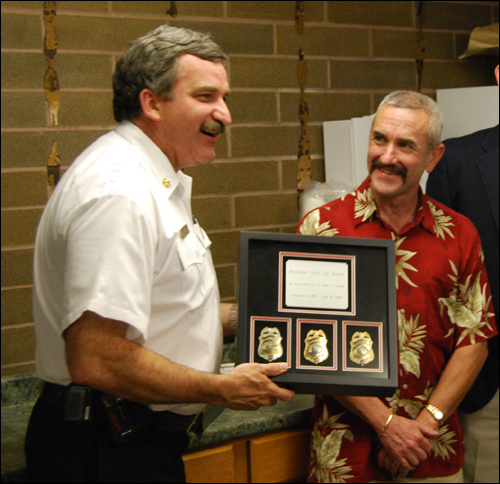 While this memorandum was written in 2003, lack of adequate size up and risk assessment was a contributing factor in three incidents resulting in four line-of-duty deaths involving Houston Fire Department members in subsequent six years. The Houston Fire Department Strategic Plan for FY2008-2012 (n.d., HFD) identifies safety as a core organizational value, stating: �preservation of life remains the number one goal of the HFD beginning with the responder and extending to the public� (p. 5). This focus continues with enhancement of the health and safety of HFD members as the first goal within the strategic plan. However, while the strategic plan provides a detailed blueprint for action, no objective or action plan element addresses the predominant contributory factors that are common in the seven line-of-duty deaths of Houston Fire Department members resulting from traumatic cause between 1999 and 2009. For example, Objective 1.5 of the strategic plan focuses on National Fallen Fire fighter Initiative #1 which states �define and advocate the need for cultural change within the fire service relating to safety; incorporating leadership, management, supervision, accountability and personal responsibility (HFD, n.d., p. 8). However, the sub elements of this objective focus on near miss reporting, roadway emergency safety, and response to violent incidents. In the incident that took the lives of Captain Harlow and Firefighter Hobbs, several elements point to the focus on speed and aggressive action. Despite his seniority and experience, the captain of the first arriving engine quickly initiated an interior attack without adequate size-up and risk assessment (or performed a size-up and failed to recognize critical fire behavior indicators). In addition, he left his portable radio on the apparatus, E-26s thermal imaging camera (TIC) was left outside the front door. Any one of these elements alone might indicate a simple error, but in combination along with the context provided by previous LODD incidents (NIOSH, 2001, 2002, 2005a, 2005b) this is likely evidence of the cultural value of speed and aggressive action over deliberate assessment of conditions and decision-making based on risk assessment. While increased protection through the use of the reed hood has significant potential benefits (similar technology is used by the Swedish fire service), it is quite possible that this type of personal protective clothing (which is somewhat unique to the Houston Fire Department) is used to permit fire fighters to penetrate deeper into hostile environments, rather than simply to provide improved protection with the ordinary or hazardous range of conditions encountered during structural firefighting. Based on these factors identified in NIOSH Report F2009-11 (2010) as well Reports F2000-13, F2001-33, F2004-14, F2005-09 (2001, 2002, 2005a, 2005b), I recommend that fire service organizations assess the impact of their organizational culture on fire fighter safety and operational performance. Note that this recommendation is not simply focused on the Houston Fire Department. It is a global recommendation, that each of us examine the influence of culture within our respective organizations. National Transportation Safety Board (NTSB). Aircraft accident report: Britt Airways, Inc. d/b/a/ Contenental Express Flight 2474 in flight structural breakup, EMB-120RT, N33701, Eagle Lake, Texas, September 11, 1991, NTSB/AAR-92/04. Washington, DC: Author. National Institute for Occupational Safety and Health (NIOSH). (2001). Death in the line of duty, Report F2000-13. Retrieved January 24, 2010 from http://www.cdc.gov/niosh/fire/pdfs/face200013.pdf. National Institute for Occupational Safety and Health (NIOSH). (2002). Death in the line of duty, Report F2001-33. Retrieved January 24, 2010 from http://www.cdc.gov/niosh/fire/pdfs/face200133.pdf. National Institute for Occupational Safety and Health (NIOSH). (2005a). Death in the line of duty, Report F2004-14. Retrieved January 24, 2010 from http://www.cdc.gov/niosh/fire/pdfs/face200414.pdf. National Institute for Occupational Safety and Health (NIOSH). (2005b). Death in the line of duty, Report F2005-09. Retrieved January 24, 2010 from http://www.cdc.gov/niosh/fire/pdfs/face200509.pdf. 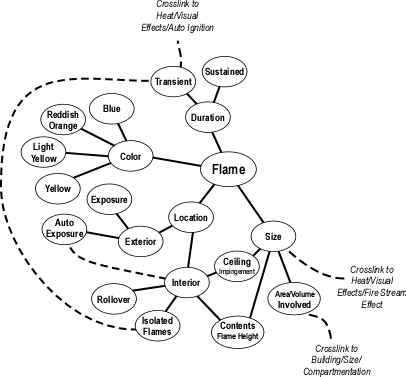 The first post in this series, Reading the Fire: How to Improve Your Skills, I discussed building a concept map of fire behavior indicators as a method to increase competence in reading the fire. In the 12 posts that followed, we have explored each of the categories of the B-SHAF organizing scheme by developing a concept map for each type of indicator. I have been working through this process as well in an effort to expand and refine my personal B-SAHF concept map. This post will review the work accomplished so far and lay the foundation for moving to the next step in the process; applying B-SAHF to recognize key indicators and predict likely fire behavior. This review will be graphic, using the current version (5.2.2.1) of each of the concept maps developed in this series of posts. Unlike the other elements of the B-SAHF organizing scheme for fire behavior indicators, Building Factors are present before the fire. 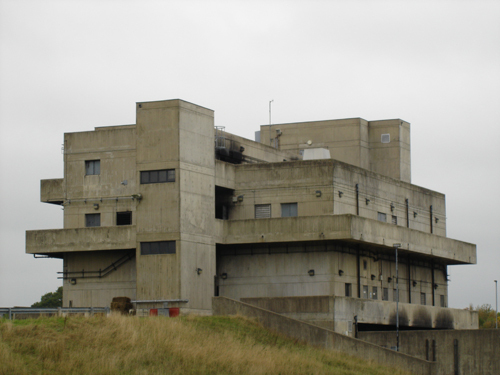 Frank Brannigan was fond of saying “the building is the enemy” (Brannigan & Corbett, 2008, p. 81). The term enemy (2009) can be used to describe one who is antagonistic or seeking to injure or harm another. In this sense the building is not our enemy as it has no intent. However, it may also be used to describe something that is potentially harmful (Enemy, 2009). From this perspective Frank could be correct. However, I find that in the use of warfare as a metaphor for firefighting, I find it more useful to consider the building as the terrain that we fight on, rather than the enemy. Building factors (such as use of lightweight or engineered wood support systems) present a significant hazard, but only under fire conditions. Fire dynamics and building performance under fire conditions are interrelated and should be key considerations in the pre-planning process. 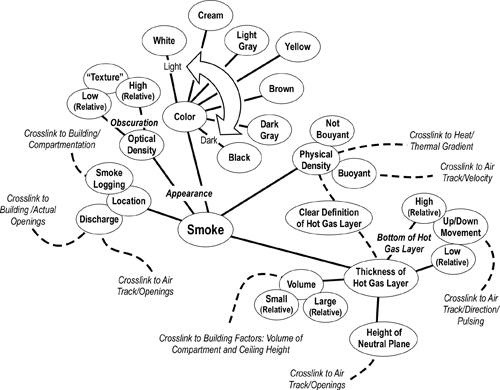 In many respects, Building Factors is the most complex category of the fire behavior indicators. 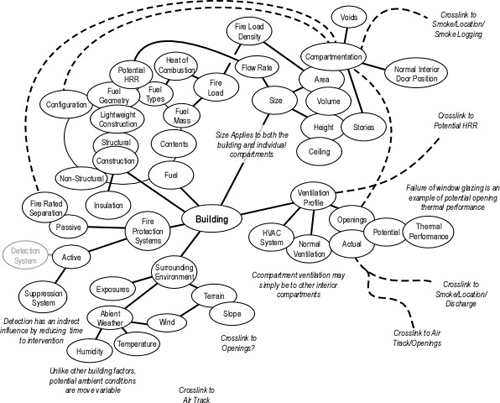 Figure 1 illustrates my current concept map capturing many (but likely not all) of the key building factors that influence fire behavior. Consider what other building factors might be of interest or concern as well as how these factors may be interrelated with the other elements of the B-SAHF scheme. 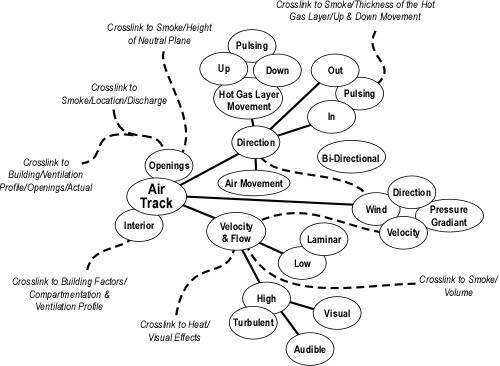 There are a significant number of interrelationships between smoke indicators and the other elements of the B-SAHF model, particularly Building Factors, Air Track, and Heat. These relationships reinforce the importance of looking at fire behavior indicators holistically, rather than simply as individual elements. Are there other indicators related to smoke that may be useful in identifying or assessing the stage of fire development, burning regime, or other important aspects of fire behavior? What additional interrelationships exist with the other elements of B-SAHF? Air track is the movement of both smoke (generally out from the fire area) and air (generally in towards the fire area). Air track is caused by pressure differentials inside and outside the compartment and by gravity current (differences in density between the hot smoke and cooler air). Air track indicators include velocity, turbulence, direction, and movement of the hot gas layer. As in the case of smoke, air track is closely interrelated with Building Factors, Smoke, and Heat Indicators. Are there other air track indicators that might be useful in assessing conditions and making predictions about likely fire behavior? What other interrelationships exist between air track and the other elements of B-SAHF? In considering heat indicators, it is important to distinguish between energy, temperature, and heat. While this category is titled heat indicators, much of what we observe and feel is based on increased temperature due to transfer of energy (energy in transit is heat). To review the discussion of energy, temperature and heat, see Reading the Fire: Heat Indicators. What other heat indicators may be useful in assessing conditions, the risk to firefighters, and impact of tactical operations on fire behavior? Are there additional interrelationships with other elements of B-SAHF? Flames are the visible, light emitting product of combustion. In compartment fires, flames are the result of glowing particulate material (predominantly carbon). While extremely useful, information from flame indicators must be considered in conjunction with the other elements of B-SAHF. Are there other flame related indicators that might be useful? Are there additional interrelationships with other elements of B-SAHF? Are we professionals who want our skill at reading the fire to get better, every day? What does will it take for us to accomplish this task? It takes more than just talking about it or attending a class. Developing this level of skill requires ongoing, deliberate practice. Building a concept map of the B-SAHF indicators is an early step in this process as it gives you a way to think about information provided by the building and fire that will allow you to recognize important conditions and what is likely to happen next. Developing this understanding is necessary, but not sufficient. You also need to work on your skill at recognition and developing the ability to interpret this information in the context of the situation. Using video is a great way to practice your skill in recognizing key indicators. On the fireground, you may only see a particular indicator for a few seconds. There is no instant replay. However, with video you can watch a particular clip again and again to practice your skill and develop the ability to separate critical indicators from the noise of extraneous information. Reading the fire and recognizing likely and potential fire development is a critical part of initial size-up and action planning. However, this process needs to continue throughout incident operations as you evaluate the impact of tactical operations (the responsibility of everyone on the fireground, not just officers or the incident commander). Use the following two video clips of tactical operations to practice your skill (and maybe discover a few additional indicators to add to your B-SAHF concept maps). Video Clip1-Roof Operations: Watch this video clip of vertical ventilation operations and identify the key B-SAHF Indicators. What information do the building, smoke, air track, heat, and flame indicators provide about current conditions? How is fire behavior likely to change? Video Clip 2-Fire Attack: Watch this video clip of initial attack operations at a commercial fire. What building, smoke, air track, heat, and flame indicators can you observe in this clip? What information do these indicators provide? How do the indicators change based on application of water? What can you determine based these changes? The next post in this series will begin to examine application of the B-SAHF scheme to recognizing stages of fire development and burning regime as part of initial and ongoing size-up and situation assessment. Brannigan, F. & Corbett, G. (2008). Building construction for the fire service. Sudbury, MA: Jones & Bartlett. Last week I had the opportunity to attend the Florida State Fire College’s Live Fire Training Instructor (LFTI) Course held at the Oregon Public Safety Academy. This delivery is part of an effort by the state’s Department of Public Safety Standards and Training (DPSST) to evaluate options for improving safety during live fire training. DPSST and the Oregon Fire Instructor’s Association are evaluating curriculum and varied approaches to delivering training to assist fire service agencies safely and effectively deliver live fire training. Deputy Chief Dave Casey, Seminole Tribe of Florida Fire Department (former Chief of Fire Standards and Training, Florida State Fire Marshal) presented an overview of the origin and evolution of live fire instructor training in Florida. 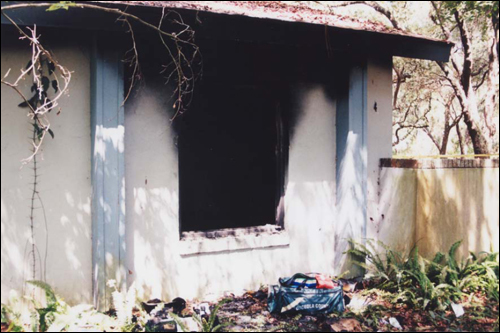 On July 30, 2002 Lieutenant John Mickel and Firefighter Dallas Begg lost their lives in a live fire training exercise conducted in �Poinciana, Florida (see Figure 1). LT Mickel and FF Begg were performing primary search ahead of the attack line during a live fire evolution in an acquired structure. Horizontal ventilation resulted in ventilation induced flashover while the search team was in the fire compartment. This training exercise was conducted in compliance with many of the provisions of NFPA 1403. However, instructors did not adequately assess the fire compartment in terms of potential fire behavior and the required fuel load to meet the desired learning outcomes for the evolution. For more information on this incident see the Florida State Fire Marshals Report and NIOSH Death in the Line of Duty Report F2002-34. This curriculum is intended to deliver a comprehensive live fire instructor training program, within a safe and controlled environment, in accordance with NFPA 1402, NFPA 1403 and NFPA 1500. In May 2005, the Florida Legislature passed the LT. John Mickel & Dallas Begg Act, requiring certification to conduct live fire training in the state of Florida and was signed into law by the Governor in June of the same year. The first pilot delivery of the Live Fire Training Instructor course was held in January 2006. This 40-hour course provides instructors with a detailed look at the standard and the opportunity to apply the standard in a variety of activities including development of live fire training plans, evaluation of acquired structures, and management of live fire training delivery. The instructional staff delivering this program was extremely knowledgeable and provided the participants with a solid grounding in both the provisions of the standard and the rationale for the design of the course. In addition, considerable effort was extended to ensure that the participants understood the physiological impact of live fire training on the participants and importance of maintaining hydration and managing heat stress. This is critical as the majority of firefighters who die during live fire training suffer from heat stress, heart attack, or some other underlying medical cause. While the LFTI course provided excellent information and is an essential element in training instructors to deliver live fire training, it does not go far enough. The LFTI course does not (yet) address the most critical issue which is the participants understanding (or lack thereof) of fire dynamics. Emphasizing the value of NFPA 1403 in a videotaped interview (American Heat, September 2003) Dave Demers (who investigated the Boulder, Colorado firefighter live fire training fatalities that gave rise to the development of this standard) stated that with the standard “you don’t need to think, you simply need to follow directions”. While this perspective was not shared by the instructional staff delivering the LFTI course, it does point to a major disconnect between the standard, course content, and predominant cause of traumatic fatalities during live fire training. 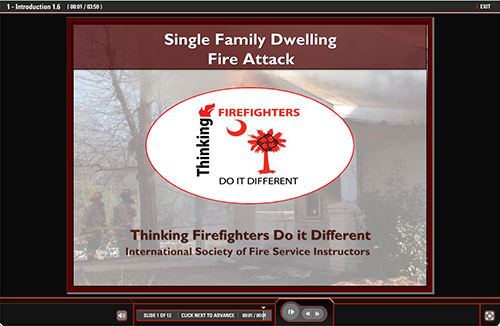 The short term solution to ensuring live fire instructors have an understanding of and can apply NFPA 1403 and practical fire dynamics is to expand course content to include compartment fire behavior and related content that is applicable to other types of live fire training (e.g., exterior props and Class B fires). However, this knowledge is required by more than instructors. The long term solution is to expand the level of knowledge required by firefighters and fire officers across the board. This will likely require revision of the applicable professional qualifications standards and related curriculum (no small task from a political perspective). I would like to extend my thanks to Florida State Fire Academy instructional staff Susan Schell, Joe Garda, Dave Casey, Dan Godfrey, and Richie Leitz for their delivery of the LFTI and ongoing efforts in support of firefighter safety. Tuesday is another milestone in my career. Effective June 30, 2009, I will no longer be employed by Gresham Fire & Emergency Services. Due to severe fiscal constraints, the entire Training, Safety, & EMS Division is being eliminated. Lieutenant Chris Baird previously went to the line as a company officer and EMS Coordinator John Stouffer and I are being laid off. Fortunately I had six months notice and have been working towards transition to a new role in a different organization (yet to be determined). While many would approach being laid off a bit differently, I chose to have the department’s traditional coffee and cake send off (Figure 2). This is not a dead end, but simply a fork in the road. Stay tuned for news of the next chapter in the adventure! American Heat (2003, September). Live Fire Training Fatalities. Florida State Fire Marshal, Bureau of Fire Standards and Training. (2002). Incident Investigation of Two Firefighters Deaths During a Training Fire; Poinciana, Florida; July 30, 2002. Retrieved June 28, 2009 from http://www.fldfs.com/sfm/pdf/InvestFFDeath_FST_20020730_20030411.pdf. National Fire Protection Association (NFPA). (2007) NFPA 1403 Standard on Live Fire Training Evolutions. Quincy, MA: Author. National Institute for Occupational Safety and Health (NIOSH). (2003) Death in the line of duty report F2002-34. Retrieved June 28, 2009 from http://www.cdc.gov/niosh/fire/pdfs/face200234.pdf. Unanticipated smoke explosion and building collapse nearly kills three firefighters. 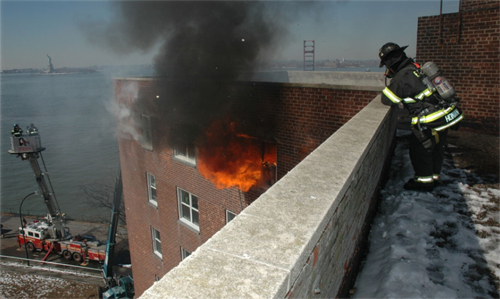 Firefighter Eric Kirk gives a firsthand account of a near-miss incident involving a smoke explosion in the June 2009 issue of FireRescue magazine. On a December morning in 2007, firefighters in Portsmouth, Virginia responded to a fire in a church. On arrival, the building was well involved and defensive operations were initiated to protect exposures and confine the fire. Over the course of the fire, smoke extended into an attached, three-story, brick building and formed a flammable fuel/air mixture. Subsequent extension of flames from the church to the interior of the exposure resulted in ignition and explosive combustion of this fuel (smoke)/air mixture. This post expands on Smoke is Fuel (Hartin, 2009), a sidebar that I wrote for FireRescue that accompanies Eric’s article examining the Portsmouth, VA smoke explosion incident. Smoke explosions have resulted in three firefighter fatalities in the United States since 2005, two in Wyoming (see NIOSH Report F2005-13) and one last year in Los Angeles California (NIOSH report pending). In addition, there have been a number of near miss incidents including this one in Virginia and another in Durango, Colorado (see NIOSH Report F2008-02)However, many firefighters have not heard of or misunderstand this fire behavior phenomenon. The terms backdraft and smoke explosion have typically been used to describe explosions resulting results from confined and rapid combustion of pyrolysis and unburnt products of incomplete combustion. Describing a backdraft incident at a Chatham, England Mattress Store in 1975, Croft (1980) states “this is not an entirely new phenomenon, the first formal description of what have been called ‘smoke explosions’ having been given in 1914” (p. 3). These “smoke explosions” frequently occur in burning buildings and are commonly termed “back draughts” or “hot air explosions” (Steward, 1914). As discussed in my earlier post, Fires and Explosions, the term Smoke Explosion was a synonym for Backdraft. In fact, if you look up the definition of smoke explosion in the National Fire Protection Association (NFPA) 921 (2008) Guide for Fire and Explosion Investigation, it says “see backdraft” (p. 921-15). However, today it identifies a different, and in many respects more dangerous extreme fire behavior phenomenon. Smoke (or Fire Gas) Explosion is described in fire dynamics textbooks such as Enclosure Fire Dynamics (Karlsson and Quintiere) and An Introduction to Fire Dynamics (Drysdale) and Enclosure Fires (Bengtsson). Of these, the text Enclosure Fires by Swedish Fire Protection Engineer Lars-G�ran Bengtsson provides the best explanation of how conditions for a smoke explosion develop. However, this phenomenon is less well known among firefighters and fire officers. In fact many well known fire service authors continue to use backdraft and smoke explosion interchangeably. A smoke or fire gas explosion occurs when unburned pyrolysis products accumulate and mix with air, forming a flammable mixture and introduction of a source of ignition results in a violent explosion of the pre-mixed fuel gases and air. This phenomenon generally occurs remote from the fire (as in an attached exposure) or after fire control. The risk of a smoke explosion is greatest in compartments or void spaces adjacent to, but not yet involved in fire. Infiltration of smoke through void spaces or other conduits can result in a well mixed volume of smoke (fuel) and air within its flammable range, requiring only a source of ignition. For additional information on transient, explosive, fire phenomena see earlier posts: Gas Explosions and Gas Explosions Part 2. It is very difficult to predict a smoke explosion. However, the following indicators point to the potential for this phenomenon to occur. As with recognizing the potential for a smoke explosion, mitigation can also be difficult. The gases are relatively cool, so application of water into the gas layer may have limited effect. Tactical ventilation to remove the smoke is the only way to fully mitigate the hazard and establish a safe zone. However, use care not to create a source of ignition (such as the sparks created when using an abrasive blade on a rotary saw). The best course of action is to prevent infiltration of smoke into uninvolved spaces using anti-ventilation (confinement) tactics. Anti-ventilation is the planned and systematic confinement of heat, smoke, and fire gases, and exclusion of fresh air (from the fire). In this case, anti-ventilation may involve pressurizing the uninvolved are to prevent the spread and accumulation of smoke. Bengtsson, L. (2001). Enclosure fires. Karlstad, Sweden: R�ddnings Verket. 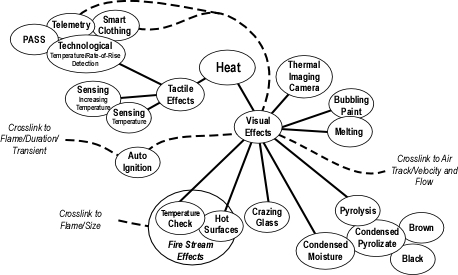 Croft, W. (1980) Fires involving explosions-a literature review. Fire Safety Journal, 3(1), 3-24. Drysdale, D. (1998). An introduction to fire dynamics (2nd ed.). New York: John Wiley & Sons. Hartin, E. (2009, June). Smoke is fuel. FireRescue, 27(6), 54. Karlsson, B. & Quintiere, J. (2000). Enclosure fire dynamics. Boca Raton, LA: CRC Press. Kirk, E. (2009, June). Sudden blast: Unanticipated smoke explosion & building collapse nearly kills 3 firefighters. FireRescue, 27(6), 52-54. National Fire Protection Association. (2008). NFPA 921 Guide for fire and explosion investigations. Quincy, MA: Author. Steward, P. (1914). Dust and smoke explosions, NFPA Quarterly 7, 424-428. 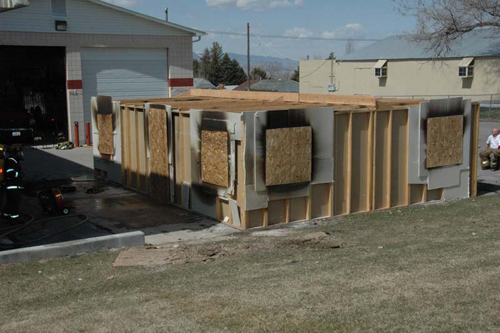 In their article Realistic Live Burn Training You Can Afford published in the May 2009 issue of Fire Engineering, Kriss Garcia and Reinhard Kauffmann extolled the advantages of constructing a panelized wood frame structure lined with several layers of 5/8″ sheetrock (see Figure 1) as an alternative to other types of structural live fire training props and facilities. I have to admit; I am intrigued by the potential advantages of this prop for demonstration of the influence of horizontal ventilation (both natural and positive pressure) and tactical training in fire attack operations. However, I am not convinced that this prop is universally superior to other types of purpose built structures used for live fire training. Choice of live fire training facilities needs to consider a range of factors including intended learning outcomes, cost (both initial and life-cycle), and environmental considerations and constraints. The most important factor to consider in design, selection, and use of live fire training props and facilities is that all live fire training is a simulation. The fire is real, but the fuel load and conditions are managed to create a specific effect (unlike in the “real world”). This does not necessarily mean that the training is ineffective, simply that each evolution is intended to provide the participants with a specific opportunity to learn and develop skills. Having conducted a substantial number of live fire training exercises in purpose built props and acquired structures, I have found that each has its advantages. Kriss and Reinhard are particularly critical of props constructed from steel containers. They state that these type of props do not provide a realistic context for showing fire development or honing fire tactical skills. I would respectfully disagree with several caveats. 1) A single compartment prop (such as a demonstration or attack cell) is not designed or intended for tactical training. This type of prop is designed to provide a safe and effective environment to demonstrate fundamental fire development in a compartment and the opportunity for learners to practice nozzle technique. 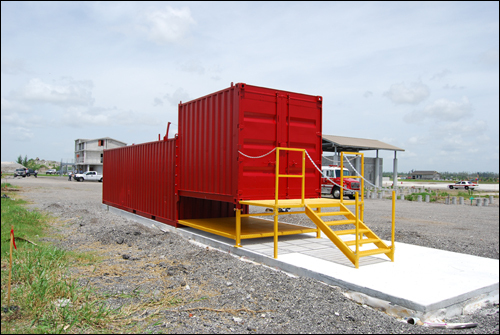 2) Multi-compartment container-based props do provide a reasonable context for tactical training with interior doors, obstructions, potential for varied fire location, etc. However, as with all other types of prop using Class A fuel (including the build and burn structure), the fuel load and configuration is considerably different than in an actual dwelling or commercial structure. Kriss also points to the severe fire conditions and damage to both equipment and participants when working in container based props. This is the result of inappropriate use, not a defect in the type of prop used. Conditions are set and controlled by the instructors. I have greater agreement with Kriss’s and Reinhard’s observations on high-tech gas fired props in that they often fail to replicate key fire behavior indicators and may not respond appropriately to ventilation and application of water, providing poor feedback to the learners on their performance. I also agree with many of Kriss’s and Reinhard’s observations on acquired structures. However, their example illustrating “unpredictable fire behavior” due to medium density fiberboard that had been plastered over, resulting in ignition of pyrolysis products behind the attack crew is inaccurate. This fire behavior was entirely predictable, but unanticipated (the big difference here is that unanticipated fire behavior is simply the result of a lack of information on the part of the instructors, not by random action by the fire). Kriss states that when working with acquired structures, you need to strictly adhere to the requirements of NFPA 1403. This may be a bit misleading in that this standard applies to all live fire training (including use of the build and burn structure). Kriss and Reinhard make a good case for the ideal live fire training structure. However, it is critical to also give some thought to the intended purpose of the building or prop. Single compartment props (regardless of what they are constructed out of) may be a tremendous tool for practicing door entry and nozzle technique much like a putting green or driving range when practicing golf. The putting green and driving range are useful tools in developing specific skills, but they are not the game of golf. The ideal live fire training prop is designed to provide a means to safely, effectively, and efficiently achieve specified learning outcomes. Much the same as there is no single tactic that will solve all problems presented on the fireground, there is no single type of live fire training prop that provides the ideal context for all types of live fire training evolutions. Again, it is critical to remember that all live fire training is a simulation. The key is to provide an adequate degree of physical and functional fidelity (look real enough and behaves real enough) to achieve the intended learning outcomes. 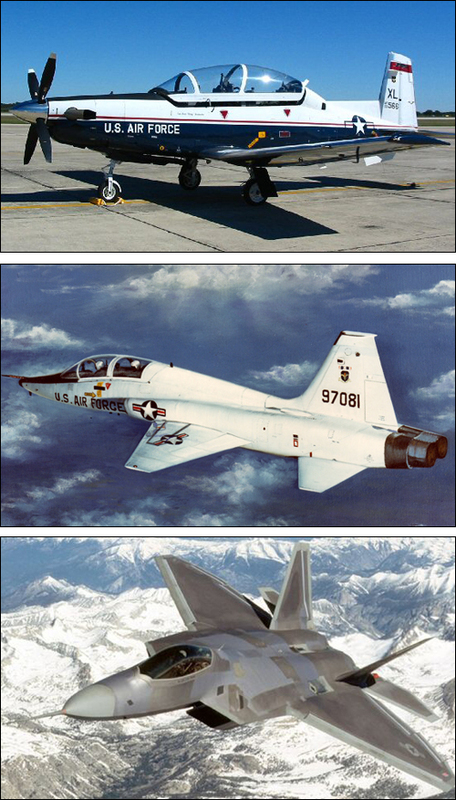 Pilots in the United States Air Force follow an exacting course of study which includes classroom instruction, simulation, and flight instruction in trainer aircraft such as theT6 and T38 before progression to more advanced aircraft such as the F22 Raptor. Each simulator and aircraft used in this progression is intended to provide the pilot with a specific learning context. After transition to high performance aircraft, pilots continue to use simulators to practice skills that may be too high risk to perform in flight. Note: This prop was constructed by Fire Training Structures, LLC and is most effective for demonstrating compartment fire behavior. Note: This prop was constructed on site and is designed to demonstrate fire behavior and the impact of tactical operations in large compartments such as found in commercial buildings. 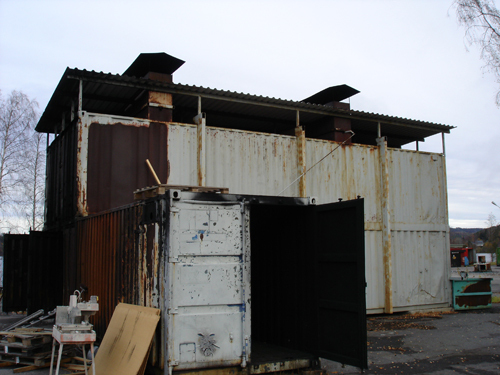 Note: This is one of many live fire training facilities at the college (including container based props and other masonry burn buildings). This building provides an industrial context for advanced firefighter training. However, for most of us it is not a perfect world. Fire departments faced with limited fiscal resources are often limited in their options for live fire training. If they are fortunate, they have or have access to a purpose built structure that provides a safe and effective environment for a variety of types of live fire training. Each of these types of structures has limitations. The major problem encountered is when instructors and learners believe that the purpose built structure is intended to fully replicate a realistic fire environment as encountered during emergency incidents. It cannot, much the same as a flight simulator cannot fully replicate flying a high performance aircraft. However, it can replicate critical elements of context that help develop knowledge, skill, and a high level of proficiency. Instructors must 1) identify the intended learning outcomes and critical elements of context necessary to develop learner proficiency to ensure participant safety and 2) recognize both the capabilities and limitations of the props and facilities available. Fire departments often face a more difficult challenge than determining what type of prop or facility is most effective or how to best use available facilities. The cost of live fire training is a major concern and unfortunately is often a major determining factor in the availability and type of live fire training conducted. The initial cost for purpose built props and facilities can be a large hurdle with simple commercially built props and structures costing from $40,000 to hundreds of thousands of dollars (or even more for a commercial fire simulator as illustrated in Figure 5). �However, initial cost of the prop or facility is the tip of the iceberg. Ongoing costs include fuel, maintenance, as well as instructor and student costs. While somewhat beyond the scope of this post, environmental considerations and restrictions can also have a significant impact on both design and operation of live fire training facilities and can also have a significant impact on initial and ongoing cost. In general, there has not been a concerted and scientifically based effort to determine the critical elements of context required for live fire training. As discussed in Training Fires and Real Fires, live fire training must look real enough (physical fidelity) and react realistically to tactical operations (functional fidelity). However, we have not defined to what extent this is necessary to develop critical skills. The variety of props, structures, and facilities available for live fire training is substantial, as is the difference in initial, ongoing, and life-cycle cost. While some work has been done comparing these various options, it is often left to individual departments to sort this out without a consistent framework or methodology. Subsequent posts will examine these two issues in a bit more depth. Garcia, K. & Kaufmann, R. (2009, 2009). Realistic live-burn training you can afford. Fire Engineering, 162(5), 89-93. NIST has performed a wide range of research that can have a positive impact on the safety and effectiveness of firefighting operations. However, all too often, this information has not made it to front line firefighters. Dan Madrzykowski and Steve Kerber have made a concerted effort to address this issue and increase the day to day impact of NIST fire research. In the video overview of the wind driven fire research, Battalion Chief Jerry Tracy of the FDNY stated that this project was an effort to bridge the gap between the science and art of firefighting and get science to the street. This video provides a powerful explanation of the potential danger of wind driven fires (in both high and low-rise structures) and illustrates how scientific research can have a positive impact on the safety and effectiveness of fireground operations. While some may discount the information presented because the research focused (to a large extent) on high-rise buildings, many of the lessons learned have applicability to a much wider range of buildings. In a high-rise building, you don’t ventilate until you have water on the fire based on potential for a wind driven fire and dramatic influence of wind and ventilation on fire behavior. Consideration of the concept that the first water on a high-rise fire [in a non-sprinklered building] should be from the exterior based on the dramatic effect of relatively low flow application from the exterior in changing conditions from severe to controllable. BC Jerry Tracy emphasized the importance of integrating the art and science of firefighting and the need for change. Credibility is critical, both from a scientific and operational perspective. He pointed to the importance of understanding impact of changes in ventilation profile on fire behavior in all types of fires and the potential benefits of alternative strategies and tactics. This two DVD set can be ordered from the United States Fire Administration (USFA) Web Site. However, orders are limited to a single set per organization. Information on this research is also available on the NIST Wind Driven Fire Research web page. Get a copy of this training package and have a look at the overview video. Ask yourself how this information can be put to work in your environment? What application does this research have beyond high-rise buildings? How can we use this information to increase the safety and effectiveness of firefighting operations in single and multi-family dwellings and in commercial buildings? In an effort to expand our network, CFBT-US is now on Twitter! Follow Chief Instructor Ed Hartin for information on fire behavior, incident information, photos and video for B-SAHF exercises. Check out the Twitter Portal for an overview video on Twitter and additional information on this social networking tool. CFBT-US is exploring how to integrate Twitter with the CFBT Blog (and the blog with Twitter). Please share your feedback on the effectiveness and utility of this approach to information sharing. This post reviews articles on positive pressure ventilation written by Watch Manager Gary West of the Lancashire (UK) Fire and Rescue Service and Battalion Chief Kriss Garcia of the Salt Lake City Fire Department. Gary, Kriss, and I were recently in Australia for a meeting of the Institution of Fire Engineers (IFE) Compartment Firefighting Special Interest Group and to present at the 2009 International Firefighting Safety Conference hosted by IFE-Australia. Gary and Kriss are both strong advocates of positive pressure ventilation (PPV) and its use to support fire attack (positive pressure attack (PPA)). In August 2008, Gary’s article Positive Thinking was published in Fire Risk Management Journal and October 2008, Kriss’s article The Power of Negative Thinking was published in FireRescue magazine. While the titles appear to be contradictory, both of my colleagues had a common theme; the importance of education and training to ensure safe and effective tactical ventilation on the fireground. Gary and Kriss both emphasize the benefits of effective use of PPV while cautioning that education in practical fluid and fire dynamics and tactical ventilation concepts must be integrated with training in PPV/PPA tactics. Gary provides an overview of the three phased approach to PPV training and implementation commonly used in the UK. This approach is designed around building understanding of key concepts and competence in tactical skills while minimizing risk. Phase I-Post Fire Control PPV: In this phase, PPV is limited to clearing smoke after the fire has been controlled. In many respects this is the simplest and safest application of PPV. Phase 2-Defensive PPV: In Phase 2, PPV is used during firefighting operations to clear smoke logged areas not involved in fire. This approach requires confinement of the fire using structural barriers (e.g., closing doors) and placement of hoselines. This tactical approach is less common in the United States, likely due to differences in construction. However, use of PPV to clear and then pressurize attached exposures can be an effective tactic in limiting smoke and fire spread. Phase 3-Offensive PPV (PPA): In the third phase, PPV precedes fire attack and has a direct influence on fire behavior as well as clearing smoke from the entry path and uninvolved areas of the building. It must be understood that PPV is a tool that will save the lives of casualties, and also reduce the risk to firefighters, if used correctly. Initial training should cover all aspect of fan configurations, the different phases of PPV, and include an understanding of the way in which fire behaves generally [emphasis added], among other things. However, it cannot be emphasized enough that, if used incorrectly, PPV is a potentially life-threatening and, as such, an ongoing training and development programme ought to be available to all users [emphasis added] (P. 49). Gary provides a solid overview of the three phased approach to PPV training and implementation used in the UK and advocates for progression to Phase 3, positive pressure ventilation in support of fire attack. However, I take exception to two statements made in this article. The first relates to the relationship between the size of inlet and exhaust opening. “It is widely understood that the size of the exhaust(s) must add up to less than the surface are of the inlet in order that positive pressure is achieved.” This is incorrect. As outlined in my previous post, Positive Pressure Ventilation: Inadequate Exhaust, the exhaust opening should be at least equal to the size of the inlet and preferably two to three times the area of the inlet opening. The second statement relates to water application technique. “Students have a temptation to apply water using pulsing and gas-cooling techniques. However, it is not necessary in this mode of PPV [Phase 3]. While of less concern than inadequately sized exhaust openings, use of PPV does not necessarily negate the use of gas cooling. Depending on firefighters operating location and conditions encountered, cooling hot gases may still be necessary, particularly away from the path leading from inlet to outlet. Nozzle techniques and water application should be determined based on conditions, not the ventilation tactic being used. However, that said, Gary is correct that excess steam produced during attack in the fire compartment will be carried out the exhaust opening. Kriss shares much of Gary’s perspective regarding the value of PPV and in particular its use to support fire attack (Phase 3/PPA). �However, the main focus of The Power of Negative Thinking is on the practical aspects of the fluid dynamics involved in PPV. Kris points out that the application of positive pressure at an inlet simply adds a slight amount of pressure to direct the flow of fire effluent from the inlet to the exhaust opening(s). Kriss states that “When PPA goes wrong, it’s usually attributable to one or two conditions, or their combination. First, mistakes result from a lack of coordination and control on the fireground including a lack of department wide training and education in the use of PPA. Second, problems may arise from insufficient or not forward exhaust. When products of combustion are emitted under pressure adhead of the attack crews, substantial exhaust is need (P. 39). One of the most important points that Kriss raises in this article is the importance of reading conditions at the inlet opening (which he refers to as the “ventilation” opening). “If heavy smoke and/or fire is returning to the attack entrance [and] exhausting above the blower, do not enter“ (p. 39) [additional emphasis added]. This article also outlines initial considerations for using PPV in support of fire attack Phase 3/PPA). Of particular importance is training and educating members in theory, application, and precautions involved in the offensive use of PPV. In addition, departments training and implementing the use of this tactic must define when it will be used (e.g., fire conditions, building types). This article raises important points in developing an understanding of why PPV works (e.g., pressure differences) and provides a straightforward explanation of its safe use in support of fire attack. However, Kriss indicates that the pressure generated by the blower is less than that created by the fire and expansion of steam due to fire control operations. This is inconsistent with the results of research conducted by NIST (Kerber & Madryzkowski, 2008; 2009). On a related note, Kriss’s assumptions regarding pressure generated by steam expansion are dependent on excessive or inappropriate water application during fire suppression operations (which is not necessarily a given). In these two articles, Gary and Kriss raise a number of important points and focus attention on the importance of understanding not simply what and how, but why. Kriss’s emphasis on the importance of having a decision-making framework and assessing conditions to determine if PPV is working prior to entry is absolutely critical. Sometime in the next couple of months I will expand on the topic of command, control, and coordination of fire control and ventilation. West, G. (2008, August). Positive thinking. Fire Risk Management, 46-49. Kerber, S. & Madrzykowski, D. (2008).Evaluating positive pressure ventilation In large structures: school pressure and fire experiments. Retrieved May 17, 2009 from http://www.fire.nist.gov/bfrlpubs/fire08/PDF/f08016.pdf. Madrzykowski, D. & Kerber, S. (2009). Fire Fighting Tactics Under Wind Driven Conditions. Retrieved (in four parts) February 28, 2009 from http://www.nfpa.org/assets/files//PDF/Research/Wind_Driven_Report_Part1.pdf; http://www.nfpa.org/assets/files//PDF/Research/Wind_Driven_Report_Part2.pdf; http://www.nfpa.org/assets/files//PDF/Research/Wind_Driven_Report_Part3.pdf; http://www.nfpa.org/assets/files//PDF/Research/Wind_Driven_Report_Part4.pdf. Application of the B-SAHF (Building, Smoke, Air Track, Heat, & Flame) organizing scheme for critical fire behavior indicators to photographs or video of structure fires provides an excellent opportunity to develop your knowledge of fire behavior and skill in reading the fire. This video clip was recommended by Captain Virgil Hall, Tualatin Valley Fire & Rescue. Virgil is stationed at Station 64 and is one of TVF&R’s CFBT Instructors. Download and print the B-SAHF Worksheet. Consider the information provided in the short video clip. First, describe what you observe in terms of the Building, Smoke, Air Track, Heat, and Flame Indicators and then answer the following five standard questions? How would you expect the fire to develop over the next two to three minutes? How did the smoke and flame indicators change? Why did these changes occur (what were the influencing factors)? Special thanks to Captain Hall for recommending this video clip. Please feel free to contribute to this process and share or recommend video clips or photographs that will help us develop our skill in reading the fire. While some firefighters have heard about the incidents involving multiple fatalities, others have not and most do not know the stories of firefighters who died alone. In an effort to encourage us to remember the lessons of the past and continue our study of fire behavior, I will occasionally be including brief narratives and links to NIOSH Death in the Line of Duty reports and other documentation in my posts. The first narrative in this post is incomplete as this incident, resulting in the death of two members of the Houston Fire Department occured last Sunday. It is important for us to continue our efforts to understand and mitigate the complex and interrelated factors that result in firefighter fatalities occuring during structural firefighting operations. Captain James Harlow and Firefighter Damion Hobbs of the Houston, Texas Fire Department lost their lives in the line of duty while conducting primary search in a single family dwelling on the morning of April 12, 2009. Preliminary information indicates that Captain Harlow and Firefighter Hobbs were trapped by rapid fire progress, possibly influenced by wind. The Houston Fire Department, Texas State Fire Marshal, and National Institute for Occupational Safety and Health (NIOSH) are all investigating this incident. More information will be posted as it becomes available. On April 11, Lt. Michael Mathis and Private William Bridges of the Memphis (TN) Fire Department were killed when they became trapped and overcome by smoke during a fire on the ninth floor of a high rise building. Two civilians also died in the arson fire. Lt. Mathis became disoriented when he was caught in rapidly spreading fire conditions on the fire floor, burning him and causing his SCBA to malfunction. He found his way into a room on the ninth floor were he was later discovered by other fire crews with his SCBA air depleted. Private Bridges, aware that Lt. Mathis was unaccounted for after several unsuccessful attempts to contact him by radio, left a safe stairwell where he had been attempting to fix a problem with his own SCBA. Investigators believe Bridges was trying to locate Lt. Mathis. Bridges became entangled in fallen cable TV wiring within a few feet of the stairwell, and died of smoke inhalation after depleting his SCBA supply. A Memphis Fire Department investigation found many violations of standard operating procedures by companies on the scene, including crews taking the elevator to the fire floor, problems with the incident command system and coordination of companies, operating a ladder pipe with crews still on the fire floor, and a failure of personnel, including Lt. Mathis and Private Bridges, to activate their PASS devices. Technician Wilson was assigned to Tower 512, a ladder company. Tower 512 was dispatched to a reported house fire at 0603 hours. The Prince William County area was under a high wind advisory as a nor’easter moved through the area. Sustained winds of 25 miles per hour with gusts up to 48 miles per hour were prevalent in the area at the time of the fire dispatch. Initial arriving units reported heavy fire on the exterior of two sides of the single-family house, and crews suspected that the occupants were still inside the house sleeping because of the early morning hour. A search of the upstairs bedroom was conducted by Technician Wilson and his officer. A rapid and catastrophic change of fire and smoke conditions occurred in the interior of the house within minutes of Tower 512’s crew entering the structure. Technician Wilson became trapped and was unable to locate an immediate exit. “Mayday” radio transmissions of the life-threatening situation were made by crews and by Technician Wilson. Valiant and repeated rescue attempts to locate and remove Technician Wilson were made by the firefighting crews during extreme fire, heat, and smoke conditions. Firefighters were forced from the structure as the house began to collapse on them and fire conditions worsened. Technician Wilson succumbed to the fire and the cause of death was reported by the medical examiner to be thermal and inhalation injuries. An extensive report on this incident is available from the Prince William Department of Fire and Rescue: Technician Kyle Wilson LODD Report. For additional information regarding this incident, please refer to NIOSH Fire Fighter Fatality Investigation and Prevention Program Report F2007-12. Water and Other Extinguishing Agents by Stefan�S�rdqvist�was originally published (in Swedish) in 2001 by the Swedish Rescue Services Agency (now the Swedish Civil Contingencies Agency) and is used for training in practical firefighting operations. The English translation released in 2002 is an excellent resource for any firefighter or fire officer. The fire triangle is sometimes used to describe the components needed to start a fire. The fire triangle has three sides: fuel, oxygen, and heat. In some cases an uninhibited chain reaction is added to the triangle to turn it into a four-sided tetrahedron. However, this approach is far too simple to explain why fires go out. It describes the ingredients needed for combustion, but not the mechanisms which cause fires to occur or to be extinguished. For this reason, the fire triangle cannot be used in discussions about extinguishing fires. In the chapter addressing water as an extinguishing agent,�S�rdqvist addresses water application methods including surface and smoke (gas) cooling. This chapter provides a sound explanation of why steam produced by water changing phase in the hot gas layer does simply add volume and lower the level of the hot gas layer. This is supported by a mathematical explanation of the expansion of steam and contraction of the hot gases as they are cooled. My colleague, Lieutenant Felepe Bazea Lehnert of the Valdivia Fire Department observed that “it is easier to explain this if you understand calculus”. However,�S�rdqvist does an excellent job of making these concepts accessible to a diverse fire service audience. Water and Other Extinguishing Agents �is available for on-line purchase from the Swedish Civil Contingencies Agency for 335 SEK (around $45.00) plus shipping. The agency will invoice for payment Swedish Kroner after your purchase (which necessitates using a bank that can produce a check in foreign currency).